Start the year off right with a new mini satchel. Mini satchels are on the fashion radar and we can see why. If designed correctly, they are perfect for carrying only the essentials. A large handbag doesn’t make sense when you only need a wallet, smartphone, keys, and possibly lipgloss and compact. Mini satchels are the perfect blend of function and style. They aren’t the sort of bags you think you need, however their cute factor does tend to sneak up on you. Often we hear the word ‘mini’ and think it will be too small and sometimes that is the case; think super small clutches that don’t even fit an iPhone. But many of the new small handbags are perfectly sized and fit more than a tic-tac. We are happy to introduce our newest Pixie mini satchels. This adorable new size is a part of our Reid collections. Our original Reid satchel is beloved by many and we always planned to add new sizes within the range. It’s a silhouette that will be a staple in many wardrobes for years to come. We were inspired to create a new handbag that retained the same design as our original Reid, but on a smaller scale. It’s the perfect size for days when you don’t need to carry a laptop, books, magazines, and folders. 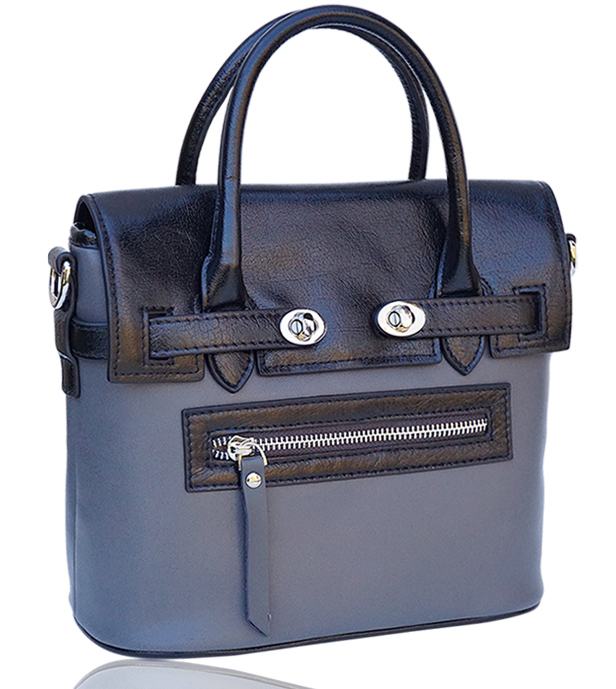 The new Pixie mini satchels come with a detachable shoulder strap for carrying/wearing hands free. Pixie mini-satchels are 9 inches wide which is the perfect size for a smaller handbag. We design many of our interiors with the fashionable techie in mind and our newest addition is no exception. The interior has an iPad mini pocket, two smartphone pockets, and leather credit card pockets. We went to great lengths to find the perfect fabric for the interior. It couldn’t be too dark as we aren’t fans of all black interiors, however, it also couldn’t be too light. Finally we tracked down the perfect light khaki color. It’s a tightly woven mid weight canvas material. Vintage silver feet keep the bottom protected. Zippered pockets grace both the front and back of the bag which is perfect for quickly storing keys, tickets and invites. Our new mini satchels are simple yet impeccably crafted leather bag is ideal for every day. In fact, it will carry you from work to dinner without skipping a beat. This new mini satchel feels and looks so relevant for now and we absolutely love carrying it. And just like all of our other designer handbags, Pixie is handcrafted by our leather craftsman.